Go green for Father's Day this year and surprise Dad with a fun (and useful) solar-powered gift! Is your dad the family grill-master? The COOKUP 200 uses the power of the sun to grill up delicious dinners with no smoke or CO2 emissions! The COOKUP 200 is designed and manufactured in France and reaches cooking temperatures close to 400 degrees F. The grill is quickly assembled, with no tools required, and conveniently collapses into a carry bag included with purchase. 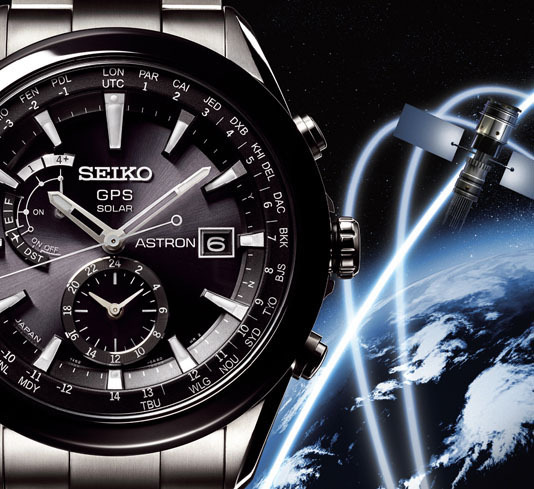 Dads on the go will love the Seiko Astron, the world's first GPS solar watch. It recognizes all 39 times zones on earth and, using a low-energy consumption GPS receiver, it automatically identifies the time of day and time zone. The Astron is incredibly accurate, keeping time to one second every 100,000 years. Best of all, it takes all the energy it needs from light and never needs a battery. Like a Swiss Army knife, the Eton Microlink FR160 solar radio packs a lot of functionality into a small package. 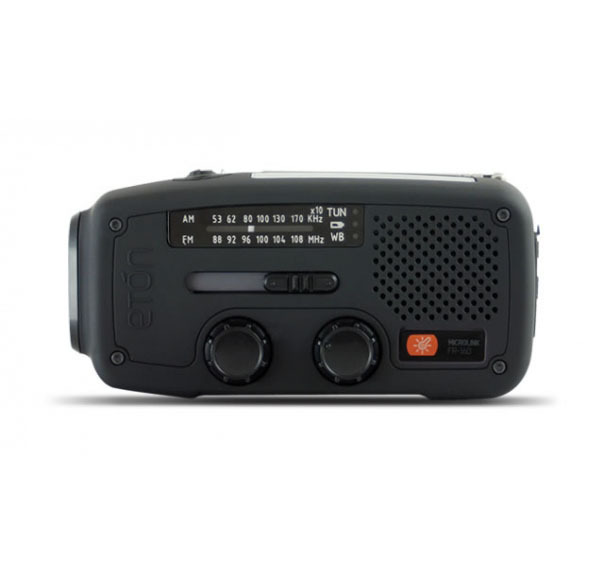 This self-powered radio can be charged using solar power or a hand crank, making it a convenient gadget for camping or emergencies. It receives AM and FM radio plus all 7 channels on the NOAA weatherband. Additional functions include an LED flashlight and a USB cell phone charger. Priced at just $30, the Microlink radio is budget-friendly, as well. 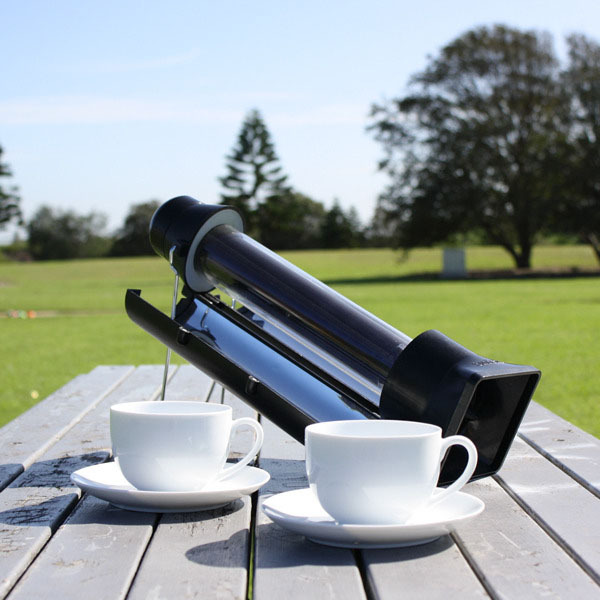 Better than an ordinary thermos, the Sunrocket solar kettle boils water on the go, giving dad the ability to brew up hot drinks anywhere the sun shines. 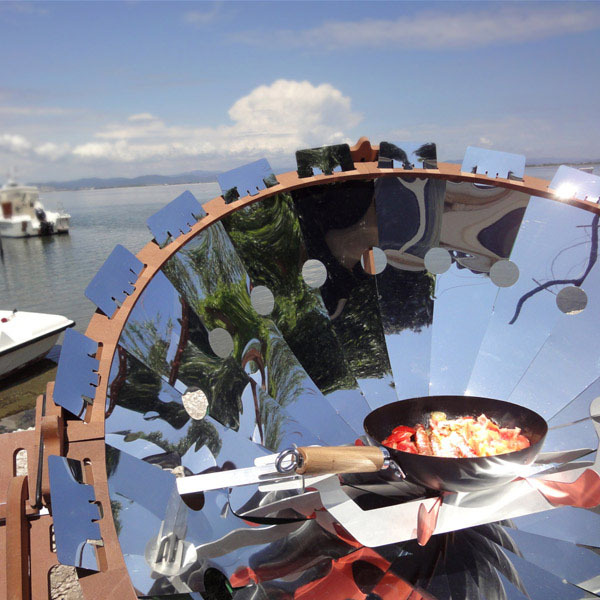 Using solar thermal technology the Sunrocket combines a vacuum tube with reflective panels to concentrate solar energy. It can heat 17 fluid ounces of liquid in 30 minutes and will retain heat for hours like a thermos. The hot water it produces can be used for drinking, washing, cooking or rehydrating foods. The heat treatment can also kill water borne bacteria. 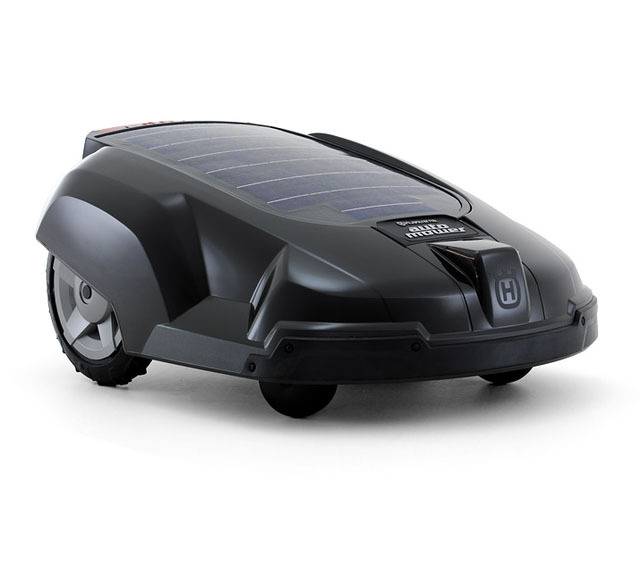 Give Dad a rest from summer lawn care with the Husqvarna Automower Solar Hybrid. Similar to robotic household vacuum systems, the Automower cruises around the yard until the mowing is complete. It stays within underground boundary wires set by the homeowner and avoids any obstacles that are at least 6 inches tall. After an hour of mowing, the mower returns to its charging station for a boost before completing its job. A 12-watt solar panel on its back collects solar energy while an electric charging station provides additional power. The American solar water heating industry has experienced its share of ups and downs through the decades. While the benefits of solar water heating haven't changed much, the technology has. Early limitations that prevented solar water heating from reaching mass appeal have been eliminated, making modern day systems as convenient as traditional water heaters. 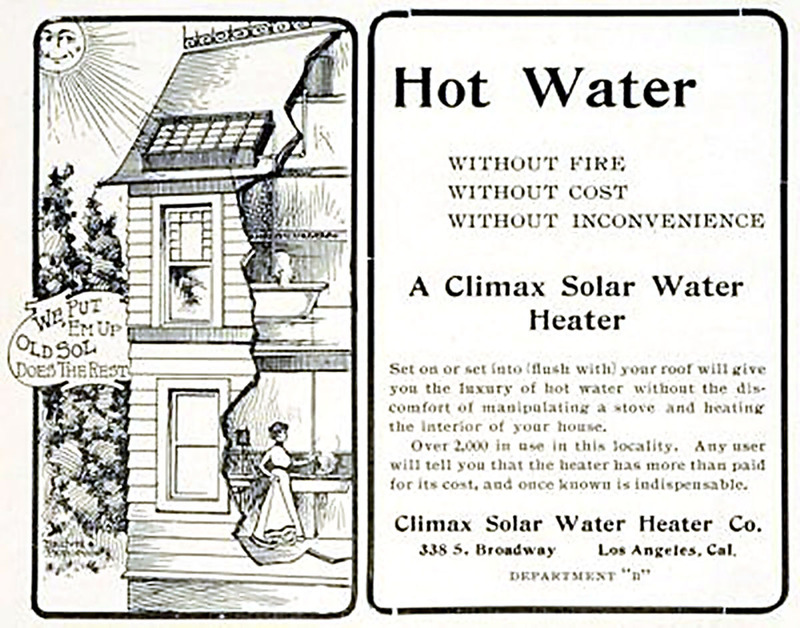 "We Put 'Em Up, Old Sol Does the Rest"
The first commercial solar water heater, the Climax, was introduced to California homeowners in the late 1800's. Patented by Clarence Kemp, the Climax sold for $25 and promised savings of about $9 per year in coal. An ad from the time, featuring a housewife in "Gibson Girl" attire and another family member in the bathtub, states, "We Put 'Em Up, Old Sol Does the Rest." The ad goes on to explain the benefits of solar hot water. "Hot Water…Without Fire, Without Cost, Without Inconvenience. Set on or set into (flush with) your roof will give you the luxury of hot water without the discomfort of maintaining a stove and heating the interior of your house." But when cheap natural gas was discovered in southern California, the market for solar water heating systems in the area effectively dried up. In the following years, interest in solar hot water remained limited to warm, sunbelt states because the systems couldn't withstand freezing temperatures. Nearly a century later, a combination of generous government incentives and a rise in fuel prices brought about a renewed interest in solar water heating. By the early 1980's, it seemed as if every new house had a solar water heating system installed. DIY solar water heating plans were popular, as well, with Americans building systems from a wide array of materials. This boon spawned a plethora of problems, however. While some manufacturers sold and installed high-quality systems still in existence today, other disreputable salesmen and poorly trained installers took advantage of homeowners. These non-professionals put systems on rooftops which failed to generate the expected energy performance or panels that leaked due to improper installations. A lot of these systems, and many of the DIY panels, suffered freeze damage making them even less desirable. By 1986, tax rebates disappeared, oil prices plummeted and most solar manufacturers and contractors went out of business. Following the "solar crash" of 1986, a handful of professional manufacturers continued to develop improved solar water heating technology. Solene solar hot water systems, for example, manufactured and distributed by UMA Solar, are at the forefront of today's solar water heating industry. Solene systems feature all the convenience and reliability of traditional hot water systems combined with the substantial savings and environmentally-friendly benefits of solar water heating. 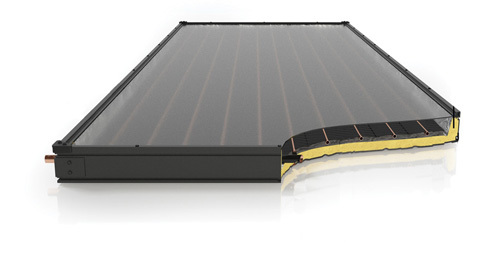 The Solene Aurora solar water heating collector combines efficiency with convenience. Solene systems are the highest-rated in the industry and can be configured for all climates and weather conditions. With certifications including FSEC, SRCC, ISO 9001:2000, OG-100 and OG-300, Solene systems and collectors qualify for current federal, state and utility company rebates and incentives. These incentives, combined with significant monthly energy savings, make Solene solar water heating systems a great investment. Most Solene systems pay for themselves within 5 years. Because these systems typically last 20 years, homeowners can enjoy an additional 15 years of free hot water. Today's eco-conscious consumers can appreciate solar water heating for more than the financial rewards, however. By investing in solar energy, consumers reduce their carbon footprint, reduce dependence on fossil fuels and leave a legacy of clean energy for generations to come.